The Reppie project will supply Ethiopia’s capital, Addis Abeba, with 30 per cent of its electricity. Ethiopia launches the waste-to-energy Reppie facility, the first of its kind in Africa. | Photo: @GetachewSS | Photo from teleSUR. 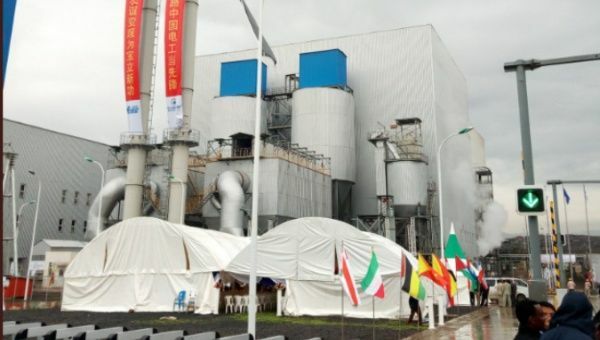 22 August 2018 (teleSUR)* — Ethiopia has become the first African country to build a fully dedicated waste-to-energy facility. Called the Reppie project, it was launched by President Mulatu Teshome, along with a host of other high-ranking government officials. Built atop the old Koshe landfill, the site of a landslide that killed 114 people in March, the facility is on the outskirts of the capital Addis Abeba and will intake 1,400 tons of rubbish each day: the equivalent of roughly 80 per cent of refuse generated by the city. In turn, it will supply the capital with 30 per cent of household electricity needs while conforming to global standards on air pollution, according to AfricaNews. “The Reppie project is just one component of Ethiopias broader strategy to address pollution and embrace renewable energy across all sectors of the economy,” said Ethiopia’s deputy permanent representative to the U.N. in Nairobi, Zerubabel Getachew. The Reppie project is a partnership between the Ethiopian government and a consortium that include Singapore’s Cambridge Industries Limited, China’s National Electric the Danish engineering firm, Ramboll. The consortium was formed to design, construct and in some cases own waste-to-energy facilities customized for African nations, according to AfricaNews. This is great progress for Ethiopia!